By Nova Scotia's Delaney and Son Pulpwood has plenty of forestry heritage and knowledge, and they are using that know-how to plan for the future--a future that is likely to include biomass harvesting. 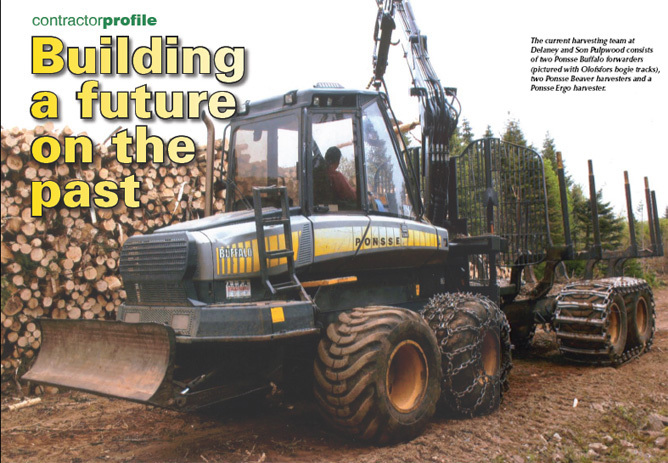 Nova Scotia's Delaney and Son Pulpwood Ltd. can reflect on three generations of forestry and harvest knowledge and experience that have made them a very successful forestry contractor. That business success and professionalism also led to their operation being honoured as Atlantic Canada's Outstanding Logging Contractor of the year. They received the award at the Canadian Woodlands Forum Spring Meetings held in Moncton, New Brunswick earlier this year. Paul Delaney is general manager and operations manager of Delaney and Son, and his father, Lionel, keeps active in the business holding administrative positions of president, secretary and director--and also dons his coveralls to help out at the shop or in the woods, as well as chasing parts and supplies. Their business is headquartered at St. Joeseph du Moine, just west of the Cape Breton village of Cheticamp, on the Gulf of St. Lawrence coast. While Cheticamp is better known for fisheries and tourism, the region also has a long tradition of forestry and shipbuilding that relied on the forest resource of the coastal plain, as well as the Cape Breton Highlands, which creates a dramatic backdrop to the very picturesque coast. The Atlantic Logging Contractor of the Year is awarded annually by the Canadian Woodlands Forum to raise the profile of logging professionals and recognize the professionalism of harvesting professionals, and their commitment to sustainable management of the forest resource. Delaney and Son was incorporated in 1987, and was preceded by D & L Pulpwood (since 1973) which was owned by Paul's father, Lionel, and Paul's maternal grandfather Alphonse LeBlanc. While D & L Pulpwood focused on harvesting pulpwood to supply fibre for the pulp mill at Port Hawkesbury, Alphonse also had an established career operating lumber camps and sawmills in the region. Currently Delaney and Son have a production target to supply 1200 tonnes a week to the New Page Port Hawkesbury pulp mill. Summer operations move on to the Highlands in May and move out to the lowlands in October, as snows shut off access to the Highlands. D & L Pulpwood went into business with chainsaw operations (50 to 60 saw operators) with camps on the Cape Breton Highlands. As early innovators, D & L explored mechanization in 1973-1978, operating two Beloit harvesters which delimbed standing trees and felled the stems for further processing by chainsaw operators. The skeletal remains of one of the burned-out Beloits remains in the same stand that Paul is currently logging. D & L also worked with early Kockums and Koehring harvesters and made the move to modern cut-to-length harvesting in 1999 with a Cat 320 excavator conversion, equipped with a Roly II processing head. The current harvesting team consists of two Ponsse Beaver harvesters, a Ponsse Ergo harvester and two Ponsse Buffalo forwarders. Paul recently scheduled a trip to the U.S. Great Lakes region hoping to add another Ponsse harvester to the team. The Delaneys' commitment to Ponsse equipment was established after witnessing an equipment demo on the Cape Breton Highlands. "They had a big demo with lots of different manufacturers, and Ponsse had factory operators in their machines and they were impressive. At the time, Jim Buntane went to work as manager for ALPA Equipment in Truro. We had a long working relationship with Jim, and that relationship continues today and we are still buying machines from them," said Paul. Paul Delaney (right) is general manager and operations manager of Delaney and Son, and his father, Lionel, keeps active in the business holding administrative positions of president, secretary and director--and also dons his coveralls to help out at the shop or in the woods. The Delaneys have had remarkable success with Ponsse equipment, with their first Beaver harvester recently clocking 48,000 hours. The original engine was just replaced and the harvester continues to operate daily double 10-hour shifts. The Delaney operation relies on a 24/7 work schedule with eighteen operators working ten hour shifts, four days on/four days off, and switching days and nights on subsequent shifts. "We change shifts in the mornings and we have a four hour maintenance period while the shifts change. We have three mechanics, and there are usually two in the woods during the maintenance period, with the third mechanic on site if there is a major repair," explained Paul. They recently built a fifty by sixty foot garage so that major mechanical work can be done indoors. The Ergo was recently in the shop for some routine work, including a new hydraulic pump, and an ALPA tech was scheduled to arrive to conduct a flow test on the new pump before it was put back to work. In the woods, the service centre is a highway freight trailer equipped with high capacity hose crimping machine welders and an extensive parts inventory. Paul pointed out a new generator that has large output to easily handle the combined power demands of hose making, welding and other power tools. The trailer is also the central repository of work and safety documentation, clearly displayed on the interior wall. Paul said weekly safety meetings are conducted during shift change so that all employees can participate, and official minutes are recorded. Additional documentation in the trailer includes occupational health and safety information, as well as training and work procedures. The work site inventory also includes requisite fuel tanks (and fire fighting water tanks in season), as well as a selection of portable bridges. Delaney underlays portable bridges with geotextile and relies on brush matting to reduce soil disturbance approaching wet sites and portable bridges. In nominating the Delaney operation, Bruce Chisholm, regional manager, Cape Breton, with New Page Port Hawkesbury, cited Delaney and Son for their strong commitment to employee safety, the quality of their forestry work and their commitment to their community. "Delaney and Son have not had a lost time accident in over seven years. Since adopting mechanization in 1999, the Delaneys have consistently increased production. In fact, through 2009, they were able to increase productivity by 20 percent through greater utilization, operator compensation and job organization," stated Chisholm. "Their use of current technologies to capture critical information allows them to make good business decisions." Delaney and Son achieves consistently high marks for their compliance audits of their work on New Page operations. The quarterly audits evaluate weekly work reports, layout, operations compliance and job quality. The detailed operations section of the audits covers everything from first aid readiness and safety protocols, through fuel storage WHMIS and Transportation of Dangerous Goods (TDG), to water quality and ground disturbance points. Similar to most operations, Delaney and Son choose mud season to update training. Paul explained that they subscribe to Nova Scotia Forest Safety Society training programs including WHMIS, TDG, and First Aid. Paul explained that mud season is also prime time for courses to upgrade employees on environmental regulations and work and operations practices. Delaney and Son has been included in New Page's regular Best Management Practices forestry training, as well as special management practices for American Pine Marten on the Cape Breton Highlands. Paul has also undertaken to become certified under the Atlantic Master Logger (AML) program. Bruce Chisholm points out that the AML certification provides third party audit of a contractor's work and harvest practices, and it neatly dovetails and supports the logging side of New Page's FSC, CSA and SFI certification. The Delaney operation relies on New Page to plan operations blocks, and then undertakes mapping the harvest operations themselves. Once maps showing waterways, wildlife blocks, forwarding trails and harvest areas are completed, they are forwarded to New Page for approval. Approved maps are returned to the Delaney office where paper copies are produced and Shape (electronic) files created. The Shape files are downloaded to the Ponsse Opti on-board computers, and back-up paper copies are kept on hand on the operation. Paul explained that they also rely on the Opti system to track machine utilization and operation costs. Each machine also has a book in which operators record mechanical issues and other pertinent information which is collected periodically and added to Delaney's information databases. While Paul and Lionel are very down to earth and exude a modest, even shy, demeanour, their business operation is very professional. They are currently looking at expanding their operation with an additional harvester, and Paul explained they are studying biomass production. This past April, New Page Port Hawkesbury and Nova Scotia Power Inc announced a plan to construct a 60 megawatt biomass cogen facility at the New Page mill. The $200 million project is planned to come into service in 2012 and will have an estimated biomass demand of 600,000 to 750,000 tonnes from mill residues and from stem wood from forestry operations. Paul said that although the start-up is some time off, he is beginning to look at biomass harvesting systems and determining how the various systems would impact and fit into his current operation. "New Page is committed to the project, and they are looking at different harvesting and transportation systems. 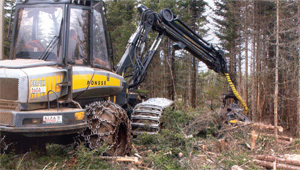 Biomass equipment is still in the development stage with companies like Ponsse," said Paul. He said he expects that biomass harvesting and transport technology will develop similarly to the way the current fibre harvesting technology developed, with some early equipment developed tested, and used and either accepted, rejected or re-engineered to allow for more cost effective means of production. Delaney and Son Pulpwood is looking forward to the future, and continuing their high professional standards, and seeking cost effective business decisions. With Paul having three youngsters at home, Paul and, his dad, Lionel, have a chance to see their families' traditional association with forestry in Cape Breton continue well into the future. Cross laminated timber (CLT), a wood building system pioneered in Europe, has the potential to boost wood use in Canada and across North America. Waratah's new 623 C processing head has proven to be a "sweet-spot machine" for contractor James Godsoe, offering the versatility he needs for harvesting a varied wood profile in the B.C. Interior. Following the closure of a nearby paper mill that was taking most of its wood chips, the family that owns Newfoundland's Cottles Island Lumber Co. took a deep breath, and made the choice to weather the downturn--and invest in a new wood pellet plant. For Henderson Contracting, making its operations more efficient includes doing its own machining and fabricating, a capability that has paid off for them and their customers. Nova Scotia's Delaney and Son Pulpwood has plenty of forestry heritage and knowledge, and they are using that know-how to plan for the future--a future that is likely to include biomass harvesting. 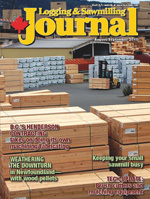 Logging and Sawmilling Journal has the latest equipment information on brush cutters and mulching equipment in this issue's Tech Update. Tony Kryzanowski on the recently signed Canadian Boreal Forest Agreement, which will see traditional adversaries from the forest industry and the environmental movement work together to preserve the integrity of ecosystems in the boreal forest.